In this episode, we meet the founder of the Detroit Artists’ Test Lab, the head of an African American podcast network called Audiowave, neighborhood activists young and old, a closet poet, and the woman who taught The Slide to a generation of skaters at Royal Skateland roller rink. Have no pity on our souls, ‘cause we don’t want it. We’re proud, and we flaunt it, like a badge of courage. We’ve taken blows, but we’re not discouraged. Been down but never out, and you better know it. Got scars, warts, and wrinkles, and we ain’t afraid to show it. Multiple Voices: Every neighborhood has a story, and every person from the neighborhood has a different outlook on said stories. The neighborhood is on a cusp of, “Are we gonna get worse? Are we gonna get better?” You can’t go but one way, and that’s up because it’s hit the rock bottom over the past, you know, twenty years or so. 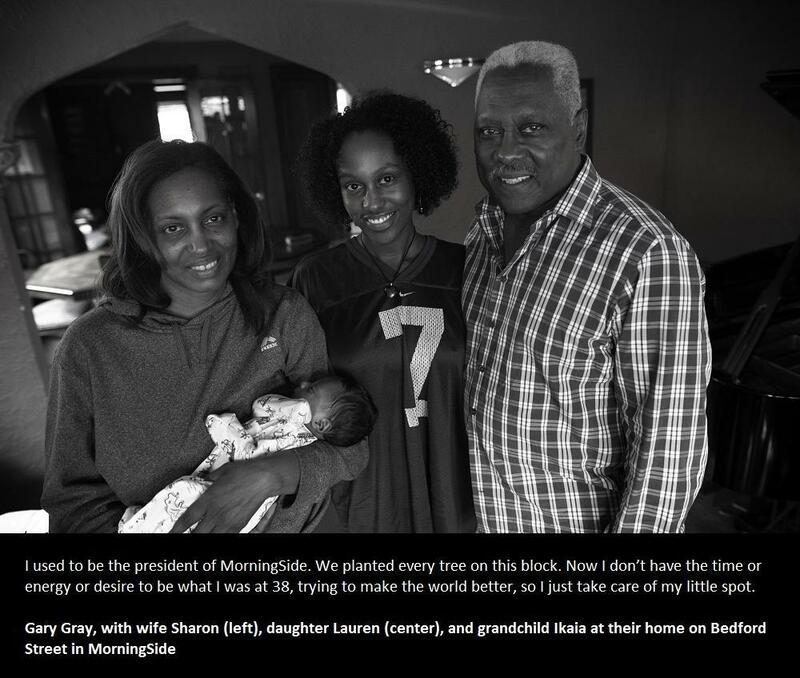 From WYPR and PRX, it’s a special edition of Out of the Blocks from MorningSide on Detroit’s east side. It’s one neighborhood, everybody’s story. 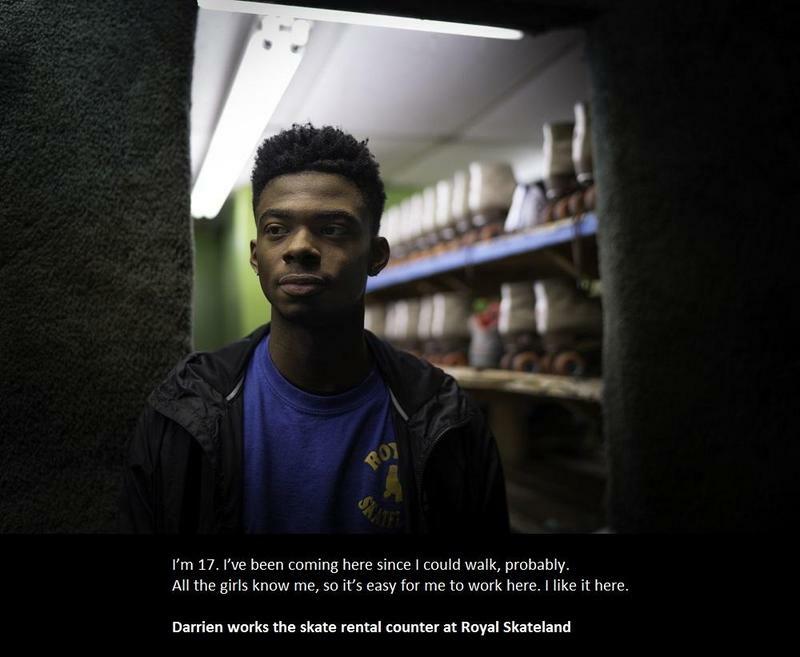 The story of regular people who go about the business of working family, and they anchor Detroit, and they just quietly do it in their own honorable way. 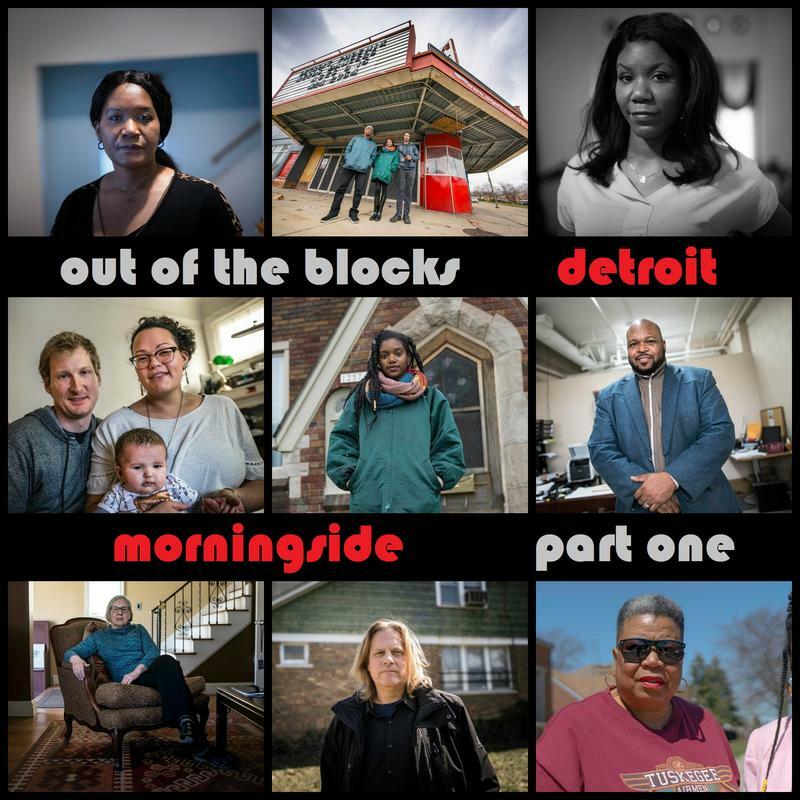 From the minds of Aaron Henkin and Wendel Patrick, in collaboration with the MorningSide 48224 podcast from Michigan Public Radio, it’s Out of the Blocks: MorningSide, Detroit, Michigan right after this. Mary: Even before you walk in through the double doors, you hear the music blasting, so that gets you pumping right away where you just wanna come in and put your skates on and you hear an old school or you hear just a song that you’ve been wanting to skate to, and you be like, “Okay, let me hurry up, get my skates on so I can get on the floor and do what I do.” I am Mary, everyone calls me Miss Mary. 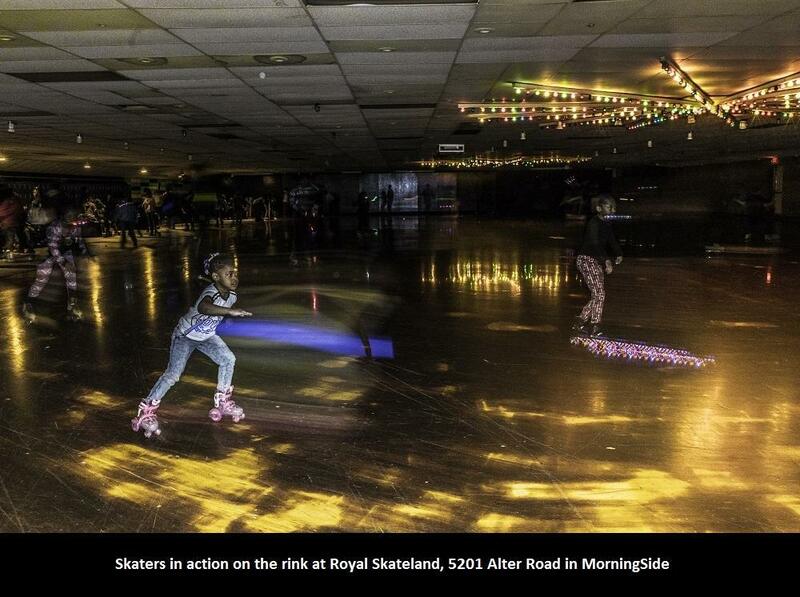 We are at Royal Skateland, 5201 Alter Road. Skateland is a place where you can go and just enjoy yourself, enjoy your families without the parents being behind you, somewhere where you drop your kids off early in the morning—as early as the rink opens—to late at night, to when it close. That’s how most of us spent our teenage years. We didn’t go home until they closed, and we was here before the doors even opened. Multiple children: My name is TJ Williams. I’m fourteen. I come here every day. My name’s Alexis, I’m thirteen, and Skateland’s awesome. I come here like every Tuesday. Skateland! I been going here for forever. Darien: I’m Darien. My job is skate counter, pass out the skates. Aaron Henkin: I see you repairing people’s skates. They’re coming over here, putting their feet up on the counter. You’re tightening them up while they don’t even have to take their skates off. D: Yeah, like, tell them to put their foot up here, and you can just fix it while they’re standing up and the skates still be on their feet. I’m seventeen. I’ve been coming here since I could walk, probably. AH: What do you like about working here? D: Mostly the girls. All the girls know me from being up here skating and stuff, so it’s easy for me to work here. I like it here. M: You start them off young, and this is something that they will wanna do. It keeps them out of trouble. AH: You are wearing roller skates right now as we are talking. You’ve got on a nice pair of white skates with gold wheels on them. How long have you been skating here? M: I’ve been skating here over thirty years. I’ve been working here for about twenty-three years. AH: And you get to do your job with roller skates on. M: Yes! That’s the fun part. That is the fun part about it. I can roller skate as much as I want. [? ]: You have the Pontiac, the half-turn, you’ve got the bop, the washing machine, slow backwards skating, fast backwards skating, it’s a whole bunch of varieties. AH: I hear there’s like a signature move here called “the slide.” Who’s gonna tell me what the slide is and how that works? [? ]: The slide is, basically, you try to slide as far as you can from one point to another. AH: You get your speed up and then you turn sideways? Glenn Urquhart: I’m an old white man in a predominantly African-American neighborhood, and at the very beginning wasn’t well-received. You know, I understand it. So, what I did to get to know my neighbors is I threw a beach party. We painted Mack Avenue blue, put twelve yards of sand down on the sidewalk, invited all the kids to come make sand castles, had hot dogs, just to get to know my neighbors and that really worked out for me. They knew I was here with my family. They understood that, you know, I wasn’t here to take any of the resources, I was here to contribute. Glenn Urquhart. 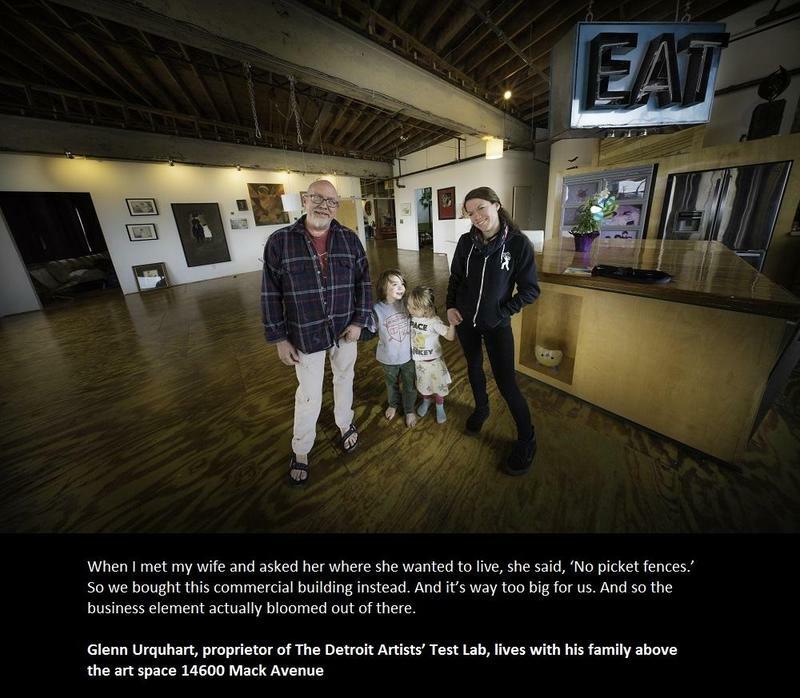 I have the Detroit Artists’ Test Lab where we do multiple things out of here. We have a photo studio, studios for young artists. We also have an art space slash event space. Well, excuse the mess. This space right here is an event space, a gallery space. Eventually, this will be a café. We’re building a gift shop over here, and then we have a bar that’s going in over there, and I also have a bartending school that runs out of here. It works out perfectly with the event space we have over there. We have offices, but we call them mini-studios, that we membership out. We don’t rent. We have memberships here. I know it’s just a play on words, but I want people to feel like, “This is my home.” Turns out that this is the best neighborhood I’ve ever been in. There’s no place else I could do the things that I’m doing. When I met my wife and asked her where she wanted to live she said, “No picket fences,” so we bought this commercial building instead, and it’s way too big for us. And so the business end of it, actually, bloomed out of there. Out of necessity. And luckily, one of my first tenants—not really a tenant—one of my first members, was JG. John Gallaway: Investing in this place was a no-brainer after I met Glenn. He told me his vision. It was, “This area will be the artist quarter of Detroit,” and it was just like, “I’m down.” Like, I’m down, say no more. I’m John “JG” Gallaway. We are in the Detroit Artists’ Test Lab, inside Audio Wave studio. The best way to picture it is closing your eyes. So, you come to the door, you have white couches, white chairs, you have sound proofing all along the wall, spotlighting to make the light control a little bit better because you want to make it more conversational and just not so doctor-office-ish, if that’s a word. But, yeah, we’re located on the east side, a place where I was born and raised. I actually started podcasting because I got sick. I had cancer at one point, and a buddy of mine was visiting my house, and he was like, you know—I was listening to a podcast and we both have that conversational style where it’s like, people love to hear this. So, we kind of just said, “Let’s do it.” Like, let’s start a podcast. [Audio sample from the podcast] My podcast is called NWP. I have a show called Bar Babes. I have a show called Academy Sports Show. I have a show called Dear Showrunners. They talk about the writing aspect of TV shows, so they dissect TV but from a writing standpoint. I always wanted, like, a podcast deal. Like, I always looked at podcasts like music artists look at record label deals. 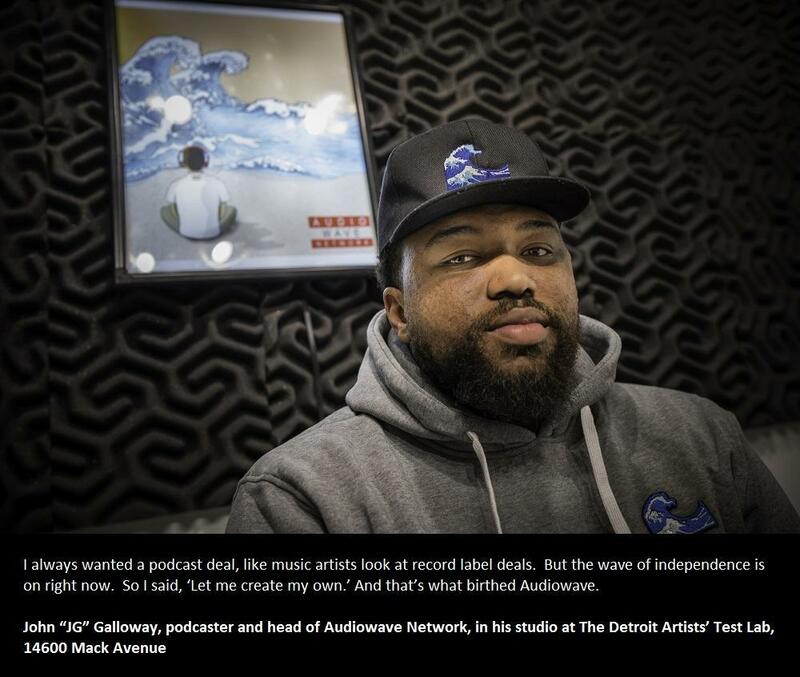 Like, I get signed, I get all this money, I do all these things… But the wave of independency is on right now, so I said, “Let me take it into my own hands, let me create my own.” And that’s what birthed Audio Wave. It’s like, I had a knack for, like, obtaining sponsorships, and I can take the knowledge I know about obtaining sponsorships and give it to aspiring podcasters, and that’s what I did. GU: Jonathan, at that point, had a regular job and since then he’s built this inside of my art studio and it’s incredible and now he’s quit his job and this is what he does. This is his deal. JG: I’m so new to business. I’m a creator, so business meetings, business conversations, it’s just like, these are the parts that I’m scared—kind of nervous, not scared, but nervous—in. But like, a mic in front of me? It’s game time. GU: His little world is in this booth, for lack of better term, but he’s affected the whole place. It’s the largest African-American-owned podcast network in North America. JG: That’s what it is, until someone proves otherwise. That’s what we’re going with. Make sure you follow Audio Wave Network, and just to all the creatives out there, create until it’s not fun anymore and be great. That’s it. AH: You have such a peaceful house, and I really like the sound of your wind chimes out there on this windy day. AH: You say that when you moved to MorningSide, you were single. That changed after you moved here. GT: Yeah, it did. I met my husband, like, soon after I got the house I met my husband, so I wasn’t a spring chicken when I got married, but it was good. God knows when doors need to open for you. I’m in my sixties now. AH: Were you looking for love at the time? Was this a surprise to you? GT: Total surprise! I was definitely not looking, definitely. So, it came out of nowhere. AH: Tell me about your wedding day. GT: Oh, wow, that was, like, unreal. Um, it was a good day. My family came from out of town and we just had a family celebration. We hadn’t had a marriage in the family for a little while so it was a very good thing so…it was good. AH: Probably made you feel like a young woman. I see a big smile on your face as you remember this. AH: Tell me his name. GT: His name is James Thomas. AH: He was obviously charmed by you. What charmed you about him? GT: Ah, my husband is—or was—about six feet tall and just had…it was just like a teddy bear in a way. So, that charmed me. I loved his laugh. He had a big laugh and he had a big heart, you know? He had a big heart. AH: How much time did you have together before he passed? GT: Oh, eight years, eight years. AH: How long ago did he pass away? GT: Oh, last month. He went in the hospital because his blood pressure had spiked and there was a tear in one of his arteries leading out of the heart, and that evening they called me… He had an aneurism, and by the time I got there, you know, of course when you get to the hospital you just zoom. You know, you’re running into the hospital, you’re running down the hallway, and as soon as I got into the ICU, I looked at his nurse and his nurse had tears in his eyes and the door was closed. And I just went in and he was gone, and I just sat there with him. You know, there’s something—I was looking documentary—that elephants do, there’s a caressing that you do. I did the same thing as a human. I don’t know, it’s… We do that, even though he was gone. It’s just that I sat there and caressed him and talked to him. I just said how much I loved him and I told him it’s okay, it’s alright, all your daughters are here, and the grandchildren are here and we love you. AH: You must be going through—sort of—a radical reorganizing of your life and your mind right now, huh? GT: Yeah. It’s… In life, blessings and burdens come together. They do not come separately. I just know that everything happens for a reason. AH: What do they say? “It’s better to have lost a love than never to have loved at all?” Is that--do you believe that’s true? GT: Oh, it is true. It is true. In life, there will be sadness and bitterness and feast and famine and joy and sorrow, and all of these things are experiences that help to provoke us to be better people. Sometimes, to see more of what our calling is or what our passion is. Sometimes, we can…we discover these things in sorrow and in very difficult situations. 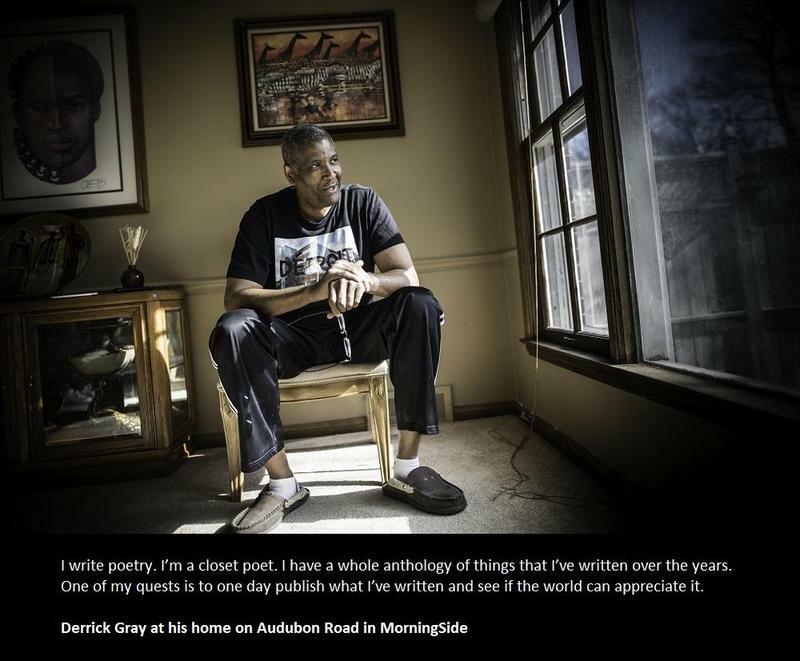 Multiple Voices: It’s Out of the Blocks, MorningSide, Detroit, Michigan. One neighborhood, everybody’s story. Artina Tinsley Hardman: I’ve always had a motto when I’ve been in public service: “If you don’t want to know the truth, don’t ask me, ‘cause I’m going to tell it.” My name is Artina Tinsley Hardman, and we’re here at Mack Alive Community Resource Center, located at 3746 Fisher Street in Detroit, Michigan. This was a building that had actually been slated for demolition. So, everything in a graveyard is not dead. AH: Wow, this is a really great… I mean, this is a bona fide classroom. You’ve got desks, you’ve got computers, you’re a full-fledged educational facility right here. ATH: We try hard, we try hard. The residents utilize the computers, they help do resumes, help to do job search, this is also where we have our literacy program to increase the knowledge of the people outside of our doors. I like to tell people we do a lot with a little. We’re not the agencies that get the big… We don’t get the million dollars, not even the hundred thousand dollars, but what we do get, we make it work and we make it happen. The building was actually vandalized and dilapidated, used for a shooting gallery. A lot of drugs went in and out of this building for many years, for many years. Drugs definitely played a big role in this entire community and the city of Detroit, in terms of its decline. Now, one thing I like to remind people is that blacks don’t own any planes, and we don’t own any big boats to get it here. So, it had to come in some kind of way. And unfortunately, it hit us and it hit us hard with the eighties and the introduction of the crack cocaine. The problem is that grandparents now are the drug addicts. You know, there was a safety net where—years ago—the grandparents could keep the kids if something was happening. But now, the same grandparents are on drugs. So who’s going to keep the kids? It’s the kid’s keeping themselves. I think one of my saddest things is that the kids have to look at all this blight. Kids have to be in an environment that includes school, and it includes being able to eat, you know, having heat, running water, those things that we take for granted. In this community, it can be challenging for some families. You have work, you have families now that don’t have running water in America, in the land of the free and the home of the brave. People don’t have running water. That’s a crime. But we have to understand that so much of what we want to see happening, we have to come together. Black people have had a history of, unfortunately, not being able to work together like we should. You know, it’s this crab in the barrel syndrome. You know, and the reality is we have to learn—I think we are learning—that as we collaborate these organizations together, that something’s going to happen, there’s going to be change. But change doesn’t just happen. People make it happen. And I’m going to make mine happen. Gary Gray: I’m Gary Gray. This is my wife, Sharon, and my oldest daughter, Lauren. AH: How long have you lived in the neighborhood? GG: Thirty years. Lauren was six months old when we moved in this house. Lauren Grey: My name’s Lauren Grey. AH: And who’s this over here in the baby holder. LG: This is my baby. This is Ekaiah. He is five weeks old. LG: So, I actually just moved back here in December, around Christmastime. So, you know, none of the old, familiar faces are here. It felt like starting over. My childhood, I remember being nice on this block. I could play outside all day with my friends and I remember having block parties. GG: This block probably was—in terms of racial composition when we moved in—fifty-fifty, white and black. It didn’t take long before that changed. So, that happened way before 2008. In come more renters, people who are less conscientious, and a few people lost their properties. But you never saw anything boarded up. Come 2008, they began to board up homes, some homes were demolished. People who were solidly middle-income, maybe husband and wife working, one or both of them lost their jobs. This neighborhood was also hard-hit by predatory lending, and this happened all over the country. But when people who live from paycheck to paycheck get hit, they lose their homes. Sharon Grey: We have, you know, several homes that are boarded—not as bad as some blocks that I have seen—but then we have some homes that people take care of their homes, too, and I have to give it to Gary with how well he takes care of our home because he keeps the outside pretty well, so when you drive up to our house it’s like, “Oh, you can tell someone is taking care of this house.” The neighbors—we know a few, but not like back in the day. When we first moved over here we pretty much knew everybody on the street. Gary was very active in the neighborhood, so he knew everybody by name. GG: I used to be president of MorningSide. We planted every tree on this block. We planted trees on the corner. We were—if they called, I was there. Lauren used to help. We had a neighborhood newsletter, and when we didn’t have enough money to mail it, we would deliver it door to door. And Lauren, Lindsay and Landon in my jogging stroller, we would go up and down the neighborhoods delivering the paper. So I was, you know, I tend to be all-in when I’m committed. Now, I don’t have the time or the energy or the desire to be what I was at thirty-eight, trying to make the world better. So I just kind of take care of my little spot. And I mean, I’m not—I don’t want to sound too jaded, you know. I can still hang with the best of them in MorningSide, but I don’t know how much longer we’ll be here. But we’re here for now. LaTisha Johnson: My name is LaTisha Johnson. My relationship with MorningSide is I am a resident in the adjacent community to MorningSide. But four years ago, I started a non-profit organization community development corporation called MECCA. 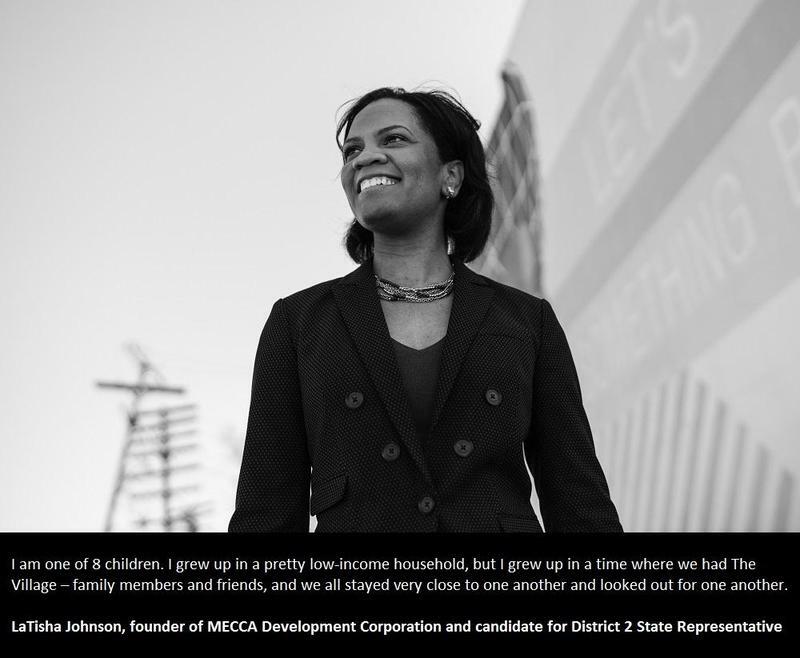 MECCA stands for MorningSide, East English Village and Cornerstone Community Advocates. Probably over a decade now, our community started to suffer from a number of foreclosures, a significant amount of blight. We’ve seen a transition from majority owner-occupants to now, majority renters and we started to see—aesthetically—the community starting to decline, and so we have come in wanting to be a resident-led, resident-driven organization to revitalize our community. I am one of eight children. I grew up in a pretty low-income household. But I grew up in a time where we had the village. We had family members that lived nearby, we had friends that were in the community, and we all stayed very close to one another. We all looked out for one another. So I grew up in, oh, I’m going to say the eighties. [laughs] So I grew up in the eighties, and unfortunately, I grew up in a time when a lot of our urban communities had substance abuse issues and we experienced that in my household. But thankfully, I have four older siblings that helped to guide and direct me and as a result, I am actually the first person amongst my siblings to get a college degree. So I see the current need for a lot of our residents to have that village around them that we don’t currently have and I think that’s what I try to recreate in everything that I do within the volunteer work, and even as I pursue elected office. As a matter of fact, I just came from downtown. I just filed to run for state representative, here in District 2. AH: What does that journey entail in the immediate future? LJ: It entails a lot of hard work. A lot of times it’s difficult to determine, “Where do you start?” But I think the idea is to have our residents—to have the community identify where we start and make sure that we collectively come together to manage our own piece of the pie, right? Because we have these phenomenal community organizations, and as long as we’re all collectively working towards the same goal, we’re going to be successful. Derrick Gray: My name is Derrick Gray. We’re in MorningSide in Detroit’s east side. I’ve been here for the last ten years. Actually, I would’ve bought the house in 2006. I’m doing insurance sales right now. I got downsized from my employer a few months ago, and so, fortunately, I took a test years ago and learned how to sell life insurance, you know, as another hustle, another side-line activity. So, when I got downsized, I’m doing it fulltime now until something else comes along, hopefully, down the road. AH: What do you do with yourself when you’re not working? DG: Sports enthusiast. You know, you can’t see on the podcast but I’m 6’7, so I played sports throughout my life, so I’m very active. I was active, not so active anymore. I’ve got a little pudge, so that kind of came with age. But I’m very competitive, very sports enthusiastic, so I’m like a football fanatic. My dad got me hooked on football from age seven. You know, to this day I’ve been a season ticket holder for the Detroit Lions for 29 years now, which takes a lot of pain and agony just to say that, but I love it. I’m a fanatic, so that’s some of what I do. I write poetry, I do somethings that a lot of people don’t even know that I do as far as that’s concerned. I say I’m a closet poet. AH: Tell me more about your poetry. When did you get into that? AH: What do you think the message of that poem is? DG: Well, the message is basically, everybody has their own vision of what things are and we see things as we see things and sometimes we don’t take into consideration how other people see things. But in reality, we are all in this one big world together and we have to try to, you know, keep that in focus. 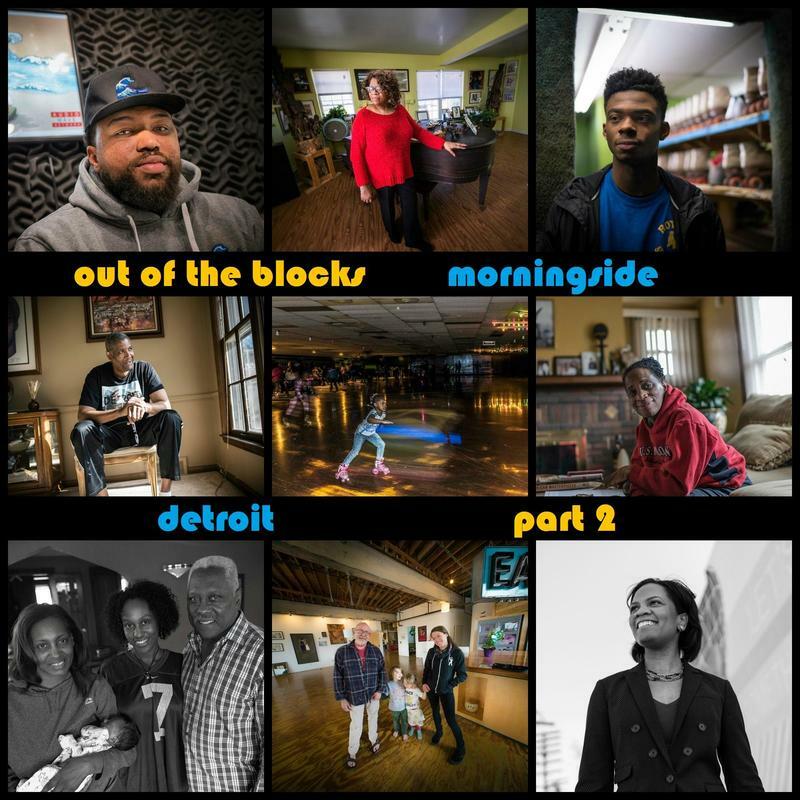 Multiple Voices: You’ve been listening to a special addition of Out of the Blocks, produced by Aaron Henkin and Wendel Patrick in collaboration with Michigan Public Radio. Special thanks to Imani Mixon of the MorningSide 48224 podcast and WYPR’s Katie Marquette. Aaron and Wendel want to thank all of us who took a leap of faith and share our stories and our lives. For WYPR and PRX, this is MorningSide signing off. DG: No, actually, I have not. No, I don’t think I’ve ever written anything about Detroit. That’s an interesting statement that you made, because I’ve… I guess maybe because I’ve lived in it. My life is the poetry. I don’t know if I’ve ever thought about it from the standpoint of writing about Detroit specifically. AH: Maybe a missed opportunity there. DG: Maybe you piqued some curiosity. Maybe I will do that. AH: Well, turns out Mr. Gray took me up on the suggestion. About a week after our visit, he sent me an email with a poem about Detroit. Imani went back to his house and recorded it for us and we’re happy to be able to share it here. DG: East side, west side, and all around D-Town. Detroit, Detroit, the Motor City, and believe you me, we can be nitty, gritty, and pretty. But have no pity on our souls, because we don’t want it. We are proud, and we faun it like a badge of courage. We’ve taken blows, but we’re not discouraged. Been down, but never out, and you better know it. Got scars, warts, and wrinkles, and we ain’t afraid to show it. We’re in the midst of another comeback, and this time we won’t blow it. You see, from the boundaries within our borders, we are 139 square miles of determination, perspiration, inspiration, and celebration. You see, we put the nation on wheels, and it feels great to know that not only did we make America rock, we make it roll. And if there’s one thing I’ll say, there will come a day when Detroit will stand erect, mend and correct all our missteps, step back into the conversation, show our best face to the nation, and once again be regarded as a municipal sensation. AH: Out of the Blocks is produced with grant funding from the Corporation for Public Broadcasting, and from the Cohen Opportunity Fund, the William G. Baker Jr. Memorial Fund, Sig and Barbara Shapiro, Patricia and Mark Joseph, Jonathan Melnick, the Andy and Sauna Brooks Family Foundation, the Hoffberger Foundation, Associated Jewish Charities, the John J. Leighty Foundation, the Kenneth S. Battye Charitable Trust, and the MuseWeb Foundation. MorningSide 48224 teams up with Out of the Blocks to share voices from MorningSide. In this special episode, MorningSide 48224 teams up with WYPR's Out of the Blocks to share voices from MorningSide. On the east side of Detroit, the streets of MorningSide are lined with stately, brick Tudor-style houses. But today, one in four of those houses is abandoned, boarded up, gutted, or burned out. 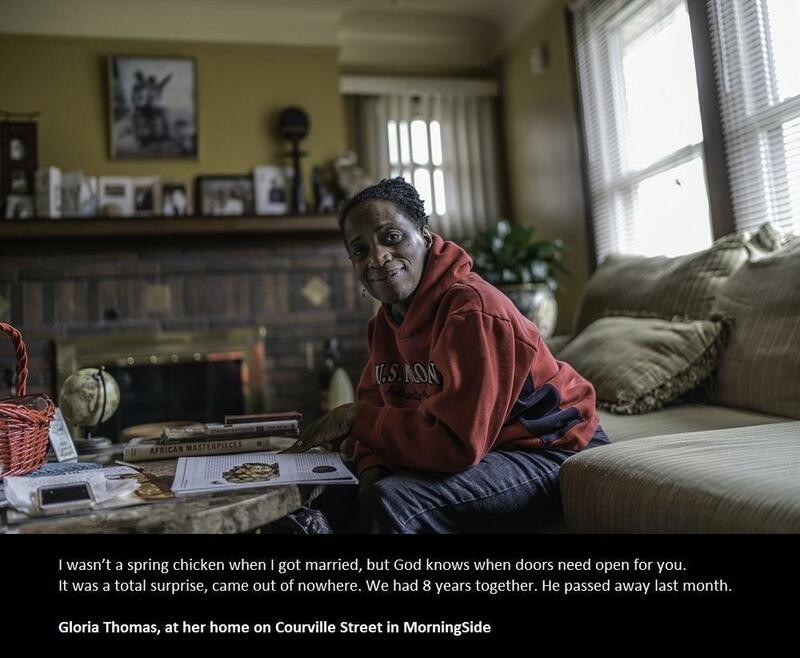 The foreclosure crisis of 2008 hit MorningSide like a tidal wave, and the neighborhood is struggling to sprout again from the rubble. There’s a lot of buzz about a new Renaissance in downtown Detroit, but the locals in this corner of town are wondering when – and if – the revival is going to make its way to them. In the meantime, they’re holding their own and looking out for each other.